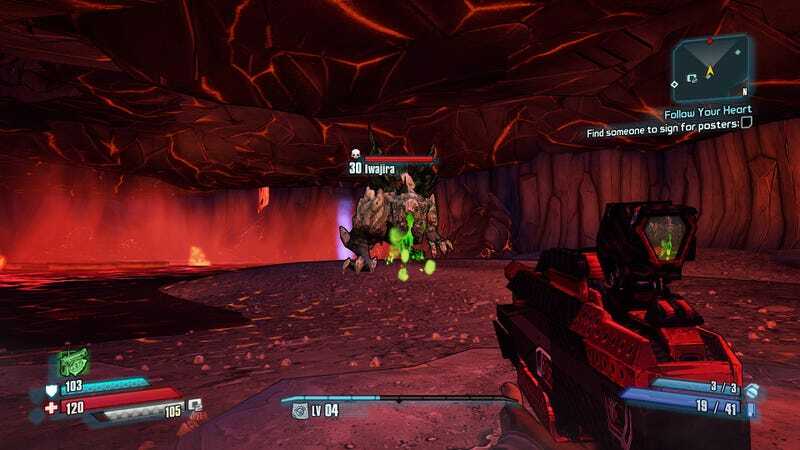 Borderlands: The Pre-Sequel's mean, green barfing machine of a secret boss thinks it's so tough. It can nearly one-shot players lower level than it is. One player, however, figured out how to one-shot it right back. He&apos;s big, mean, and green. Also pretty well-hidden. The above video demonstrates how to take down Iwajira in a single hit, and it's, well, pretty nuts. My initial temptation was to suppose, "Oh, you just need to level up a bunch," but no, Vivid Rivet did it while lower level than the volcano-dwelling force of nature. And Nisha the Lawbringer's "Third Degree" ability, which adds 160 percent to your melee damage total every time you kill an enemy. It stacks too, leading to a potentially outrageous amount of damage in one blow if you save it up for the right moment. Before sauntering in, cowboy/girl into a saloon populated entirely by tumbleweeds-style, to face off with Iwajira, you need to kill five enemies to max out Third Degree's stack effect. After that simply sprint up to good ol' Iwa, let him pop your shield, and whip him good. If you did everything right, he'll go down in a single hit. Loot will rain, baby kraggons will be forced to face cruel moon life without the guidance of a loving parent, and everyone will be happy. Everyone. Yeah, the shield's kinda tough to come by, but otherwise this isn't a super tough thing to replicate. You can fight Iwajira more than once too, so this is probably a solid method for farming, if you're into that kind of thing. Anyway, happy hunting/whipping dinosaurs until they explode.